This content was published: May 26, 2011. Phone numbers, email addresses, and other information may have changed. The buzz of hand tools and thunder of heavy machinery seem antithesis to the calm and structured environment of most classrooms. 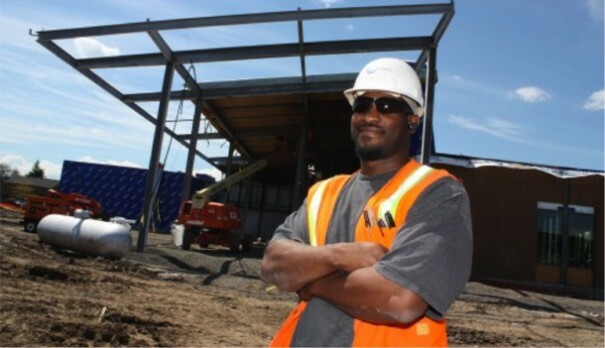 But for Quincy Attaway, who works as an assistant foreman on the Newberg Center construction project, work at the PCC job site is all about learning. Attaway works for the Newberg Center’s general contractor R&H/Colas Construction making sure the sub-contractors stay on task, things are cleaned up and architect plans followed. Quincy Attaway is learning the ropes as assistant foreman at the Newberg Center construction project. In his sixth year with the company, Attaway has worked his way up from a general laborer to the level of assistant supervisor/foreman. This opportunity allowed him the chance to work on a large-scale construction project alongside 50-plus member construction crews. Unfortunately, due to lack of work that Colas faced during the downturn in the economy a few years ago, he was let go. “It’s really hard to lay off an employee that has shown such dedication to your company, but with the scarcity of work, you’re often times left without a choice,” said Andrew Colas, President of Colas. 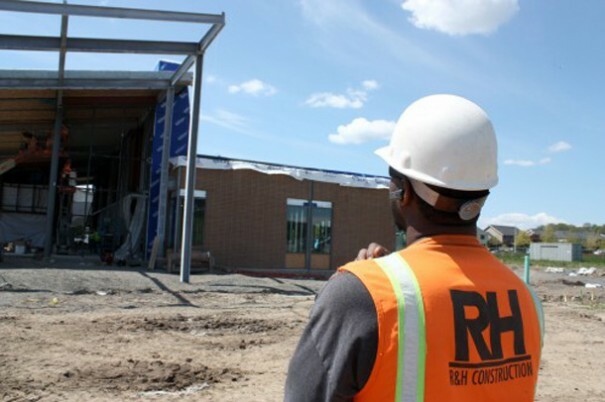 In the fall of 2010, PCC hired R&H/Colas Construction to build the Newberg Center, a new campus facility to better serve those in Yamhill County and Sherwood. This $5 million dollar project is slated to achieve Net Zero Ready and LEED Platinum certification and will be completed by fall term. “The most exciting part about landing the Newberg project was making the call to Quincy to let him know that he had a job with Colas again,” he recalled. The job has been a game-changer for Attaway, who had been staying with his uncle doing odd jobs, from being a chef at a downtown sports bar to working at a camera store. His uncle worked for Colas and he encouraged Attaway to come and help him out. Attaway keeps a close eye on the Newberg Center sub-contractors as part of his work. Now, he’s learning on the job at the Newberg Center, which could be one of the most environmentally friendly educational buildings in the country when it’s finished. With solar panels and special Structurally Insulated Panels to keep moisture and air from getting inside the facility, the center will be a gem in the PCC Bond Program. For Attaway, though, the focus on being sustainable has made him and his workmates rethink how they pickup around the construction area. Sort of a crash course on being green, you could say.